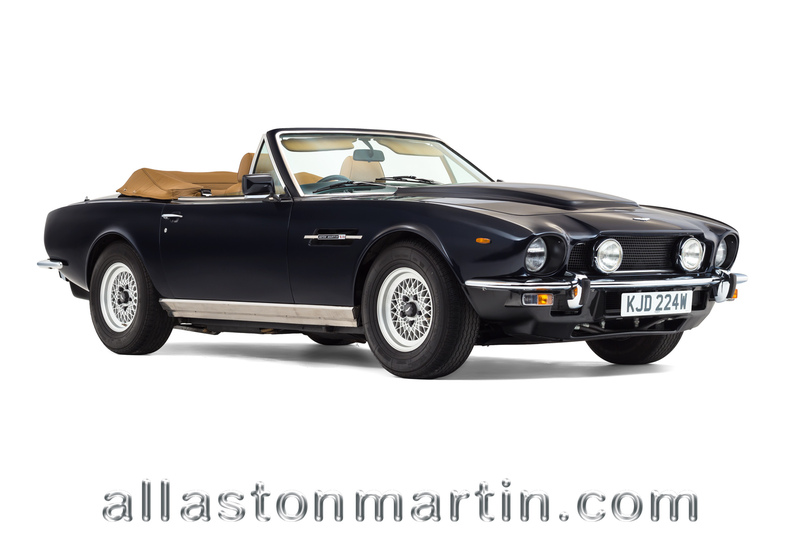 Announced on 21st June 1978 the V8 Volante was built to satisfy the persistent demands for new open four seater cars. 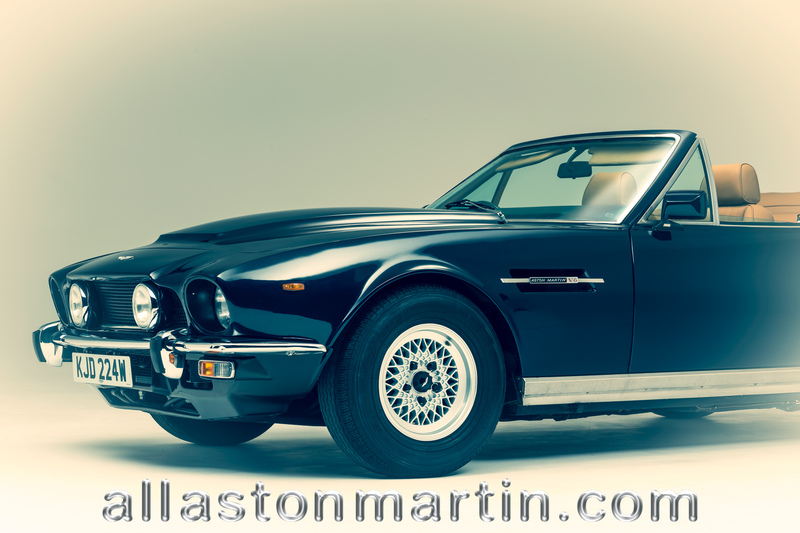 Ably demonstrated by the escalation in prices of used Aston Martin drop-head coupés, particularly in the United States. 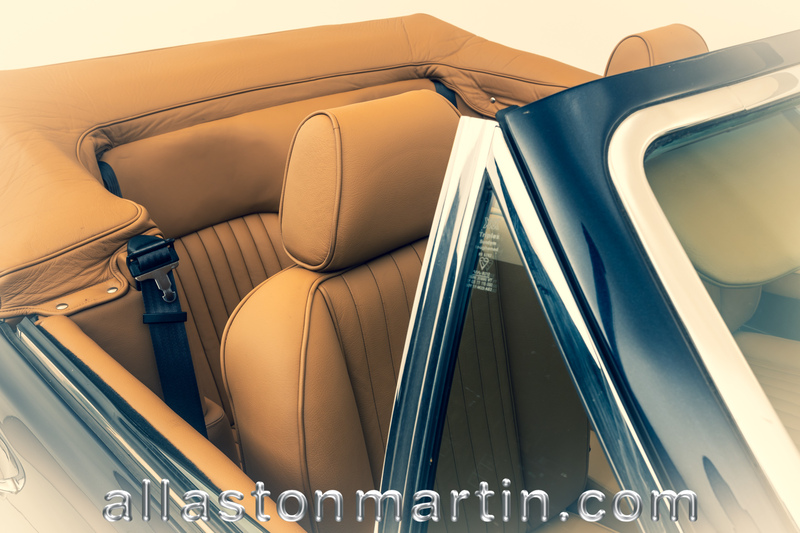 Its specification follows the contemporary V8 saloon series IV (Oscar India) announced four months later, sharing revised rear body lines, bonnet (the carburettor bulge with dummy air scope now closed at front), burr walnut dash board and door cappings. The convertible hood is fully lined and power operated. 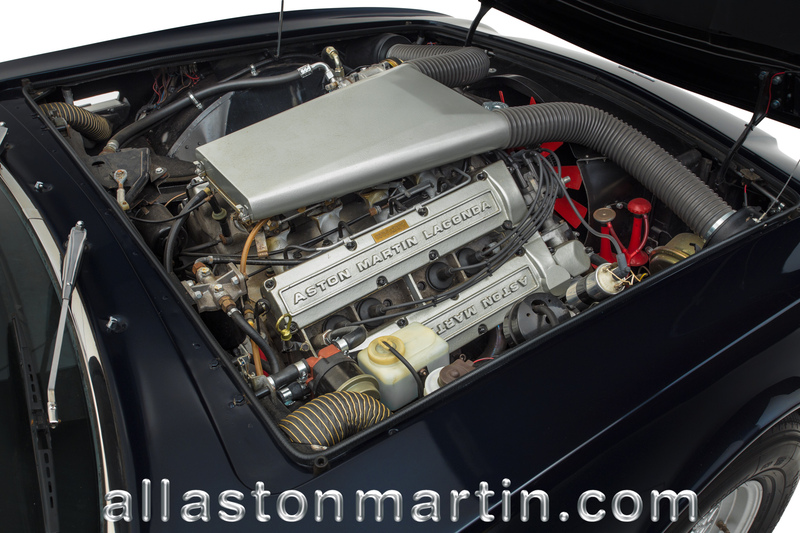 The engine, was by then the well tried and tested all alloy V8 designed by Tadek Marek that had made it's first appearance in January 1967 at the Racing Car Show in London and raced by Lola in their Type 70 Mk III GT. 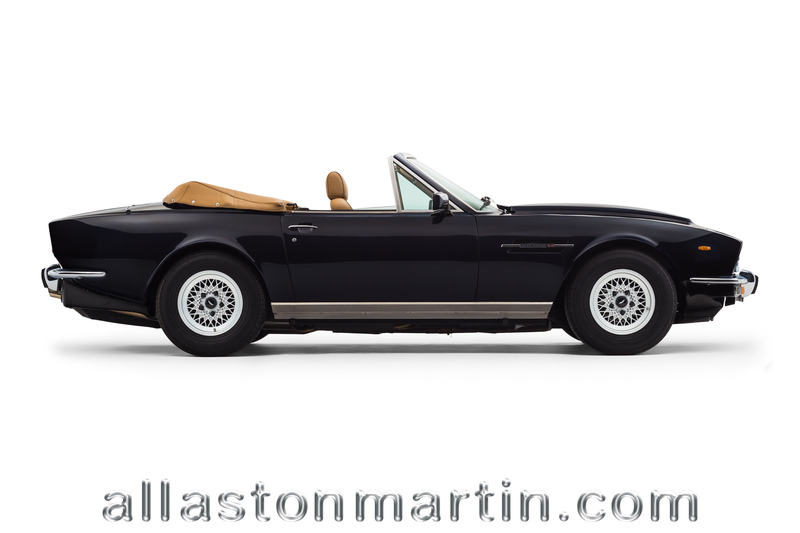 The first V8 Volante was road tested by Motor Magazine on the 3rd of March, 1979, when 0-60 M.P.H. in 7.7 seconds and a maximum 150 M.P.H. were recorded. All production until March 1981 (save the prototype) was exported to North America, with home and continental European markets following thereafter. 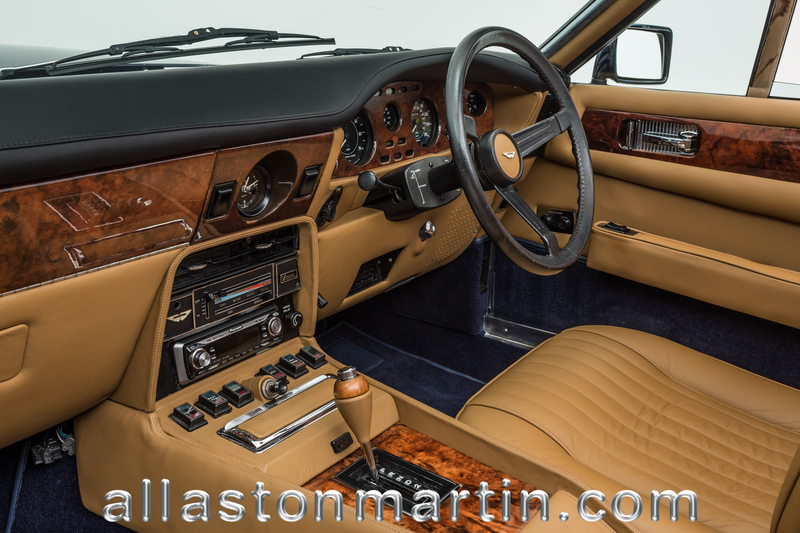 In 1983, the Volante shared a number of detailed improvements with series IV saloon such as, revised heating & ventilation controls and BBS alloy wheels. Production amounted to approximately 438 cars, between June 1978 & January 1986. However, as the majority would have been for export the used market in the U.K. remains under supplied. 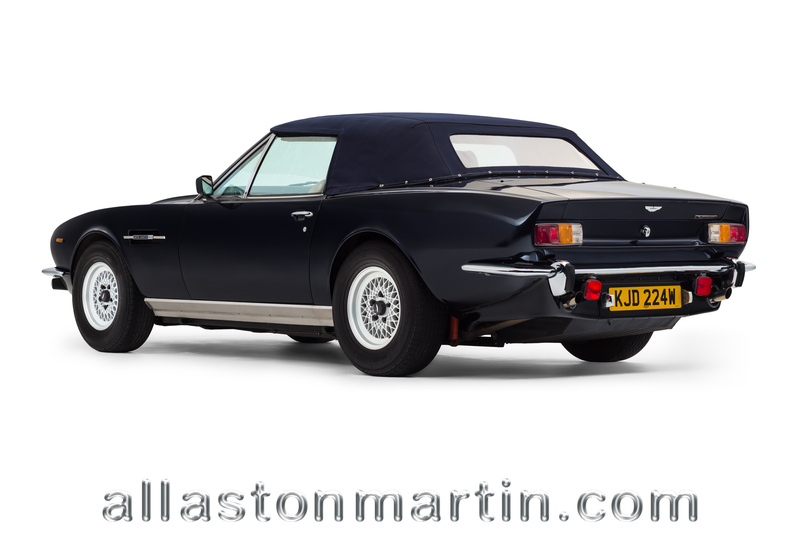 Aston Martin V8’s have always proved a popular and durable classic car and the Volante is the ultimate Grand Tourer. A full 4 seater convertible, the car offers performance allied to easy driving with the automatic transmission and power assisted steering. We are pleased to represent this car for a second time and, with the substantial improvements made in its restoration, ownership will prove rewarding from a driving as well as an investment perspective. This car was consigned to supplying dealer Reg Vardy Ltd. In 1981 and the history file has little detail of its early ownership. The first detail available was its acquisition by a London based investment company in July 1994. With regards to the vehicle’s condition, there is a report conducted by marque specialist Ian Mason on behalf of a prospective purchaser on 10th February 1995. 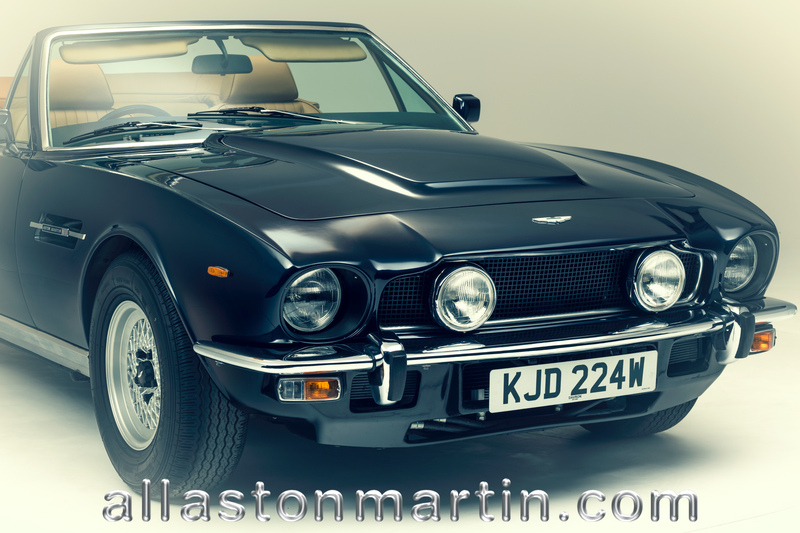 The car was on sale with Aston Martin dealer, Nicholas Mee, having been repainted to factory standard following chassis repairs and replacement sills, the car also benefited from a new mohair hood and carpets. As a result of a positive report, the car was bought by the customer, a Mr Szymonowicz. The car covered approximately 10,000 miles over the next 10 years while the owner was visiting the U.K. from his permanent home overseas then in 2005, Byron International had the pleasure of brokering the car’s sale to its current owner. 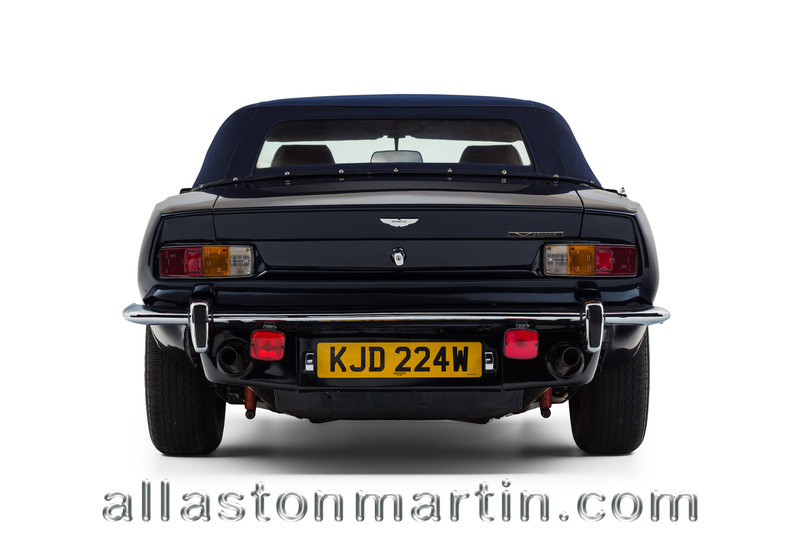 After a number of years enjoying open topped motoring in the Volante, the owners – keen Aston Martin enthusiasts – decided it was time to restore the car to its former glory and commissioned local Aston specialists, Davron, to undertake substantial restoration of the body and a rebuild of the engine. This was followed by a total retrim by Davron on their behalf with high grade hide. 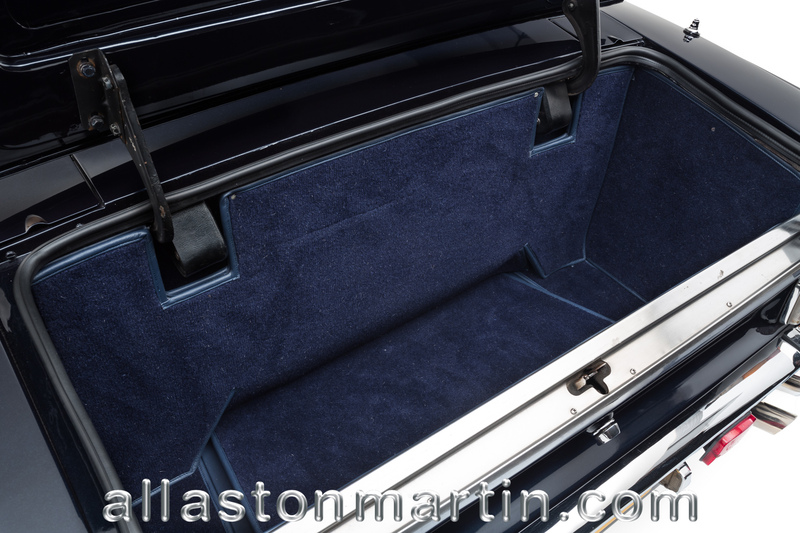 The car is therefore presented in immaculate condition and is ready for enjoying this summer. Check overheating, remove and replace viscous fan coupling.�Fit new stainless steel manifolds with new gaskets, nuts and washers.Replace top wishbones. Refit damaged vacuum pipe and air hoses, adjust gearbox kickdown. 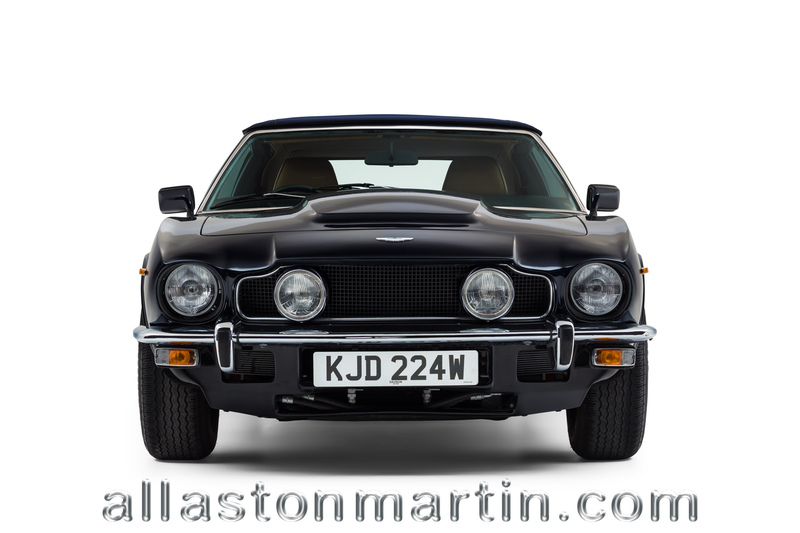 Parts only: Procurement for restoration – Outer sills, radius arm mounting brackets, front cross member, L section inner sills, jack tubes, rear jack tube kit, fuel protection covers, pedal box outriggers, V8 Volante sill strengtheners. Cut off aluminium wing bottoms to gain access to steel work. Remove both doors and replace with strut bracing. Cut off all rotten steel work in sill areas. Cut off lower radius arm mount. Cut out covering plates in chassis. Cut out all rotten steel above the rear jacking point. Fabricate steel sections for these areas. Strip off brake master cylinder and brake pipes. Cut off the master cylinder outrigger. Repair floor around outrigger. Repair other areas around sills making up sections as required. 2 additional inner sill sections required to estimate. Cut out rotten floor section behind drivers seat. Weld in new sections. Weld in all new sections and zinc coat insides prior to fitting. Repair holes in front chassis area. Test fit brake master cylinder. Cut off A post lower steel work, fabricate new and weld in place. Cut off B post lower steel work, fabricate new and weld in place. Test fit door on driver’s side. Scrape down under seal on the rest of the chassis, wheel arches and boot. Corrosion holes in boot floor and rear section. Strip out boot and all lights, remove front valance – identify need for new oil cooler and pipes due to corrosion – strip down both doors ready for steel and aluminium repairs. Sand down all areas where welding has been completed, paint all areas with red oxide paint. Remove car from the welding rig and put back on wheels. Strip off all ancillaries related to the engine and gearbox. Remove engine and gearbox from car. Clean down the gearbox ready for delivery to gearbox specialists. Carefully strip down the engine into its major components. Strip down cylinder heads and inspect – valves & guides need replacing. Oil pick up gauze has metallic material on it. Pistons #1  show signes of oil wash. Remove pistons and check rings – worn – and bores glazed. Remove crankshaft and check journals – may need polishing. Oil pump showing scoring. Sublets: Specialist welding of air injector holes in the cylinder heads. Folding strengthening sections for re-inforcement of Volante sills. Due to corrosion in boot, strip out fuel tank. Cut out rotten steel in boot area. Fabricate the re-inforcing pieces in the spare wheel area and weld in. Weld in new n/s floor section. Remove battery tray, repair underneath and weld back in. Cut out rotten sections in spare wheel hole and weld in new. Rust treat boot area then paint with red oxide. In engine bay area, cut out sections in the top of the chassis area. Epair as required on the inside area. Fold up new top sections. Weld in new top sections. Red oxide these areas. Sand back aluminium areas ready for specialist Sublet: Fabricate new aluminium wing bottoms, weld in and shape new aluminium wing sections, Make adjustments for good shut lines on doors. Rivet new aluminium wings to sills. Modify stainless steel sill covers. Dress out dent in n/s front wing ready for paint shop. Sublet: Complete overhaul of automatic gearbox and torque converter (supply of second hand toque converter due to sheared mounting.) Pressure testing of radiator, repaired to bottom hose and paint. Measuring of crankshaft journals and polish. Deliver engine block to machiners. Check the block and measure. Liner seats require hone. Fit original liners with “O” rings. Fit liners with torque plate and leave to settle. Hone liners for new rings. Check oil pump, reface surfaces and polish rotor. Engine work: Strip carburettors and manifolds, strip and paint manifolds. Put carburettors though ultrasonic cleaning bath, rebuild with overhaul kits and replace 1 idle mixture screw. Once block back from machiners, clean oil galleries and waterways. Fit all new bearing shells into block and main bearing caps. Clean crankshaft and refit journal bungs using 2 new ones. Fit crankshaft and torque down main bearings. Check end float. Clean and polish ancillaries for refit. Engine Build: Fit oil pump to block with new “O” ring. Fit engine pick up and plate to bottom of block. Fit crankshaft sprockets. Fit all timing and tensioners. Fit front timing case and associate ancillary items. Fit sump to engine and check end float on crankshaft. Set cam timing on bench prior to fitting cylinder heads. Fit cylinder heads with new internals. Fit cylinder heads to engine and set timing. Fit reconditioned water pump. Fit newly sleevedcrank pulley. Fit new torsional vibration damper. Fit ancillaries after refurbishment. Fit newly painted cam covers and air box. Make up new ignition lead set and fit new spark plugs. Fit new engine mounts – engine now ready to fit. Unleaded Conversion to both Cylinder Heads Check valve seats. Put cylinder heads on to machine to cut seats for new valves.. Machine each seat with correct angles. Push out old valve guides and hone apertures to take new ones. Fit new guides and pressure test. Lightly hone guides to correct tolerances for new valves. Lap in new valves. Check valve springs and clean all parts prior to rebuild. Rebuild cylinder heads, measure all valve clearances. Fit new set of valve shims ground to size Sublets: Power steering pump, check over and re-paint Bench test alternator and re-paint. Soda blasting of cam covers and air box. Prepare and paint. Strip out old windscreen. Clean aperture drilling out old rivets and clips. Rivet new clips in place. Fit new rubber to windscreen and let settle. Fit windscreen to car and fit all chromes. Collect car from paint shop. Place car on ramp and remove wheels. Remove ancillaries from under car including heat shields. Strip out front suspension and remove rear chassis frame. Send items for shot blasting and powder coating. Strip down rear axle assembly and send differential for overhaul. On return, re-build rear axle assembly. Clean underside and finish painting. Repair and paint heat shields. Under seal the entire chassis. Fit axle assembly back to car. Strip out radius arm bushes, replace and powder coat arms. Clean and repaint Koni shock absorbers, Refit rear shocks and rebuild front suspension with new parts as necessary. . Make up new solid brake pipes for car and fit. Recondition and re=sleeve brake master cylinder. . Fit brake servos and connect to pipes. Strip, rebuild and refit brake balance valve. . Fit reconditioned brake master cylinder. Fit new brake pads all round. Fit hand brake cables and brake fluid reservoir. Bleed brake system. Fit engine ancillaries, fit bulkhead insulation and bulkhead ancillaries. Connect gearbox to engine, check fit high torque starter motor. Fit engine and gearbox into car. Replace one steel engine mount. Fit other ancillaries an viscous fan coupling and newly powder coated (red) fan. Strip down prop shaft and replace UJ’s Paint and refit to car. Clean and polish exhaust system, weld cracks in rear silencer. Fabricate inner wheel arches. Replace rivnut mounts, paint new inner wings. Fit to car with new rubber seals, underseal all the wheel arch inner wings. Polish stainless steel sill covers, test fit, drill and fit. Fit radiator and fit all cowling parts. Fit ancillaries to radiator, polishing and painting of various parts. Fit new engine oil coolers and pipes, modify mounting of transmission cooler and fit. Modify mounts to accept modern air con condenser. Fit electric fan to condenser, fit new receiver drier and refit compressor to engine. Clean and paint ancillaries for front and rear valances and refit.. Repair lighting to number plate lights and fit. Scrape areas in boot and paint. Clean fuel tank and repair breather, refit fuel tank and connect ancillaries.. Replace battery isolator switch and repair earth lead to chassis. Refit carpets, clean and polish bumpers and refit. Refit aerial and repair wiring. Clean rear lights and refit. Strip out alarm system from wiring and repair as removed. Build up both doors with new seals, refit electric mirrors and window motors. Refit all locks and opening mechanisms. 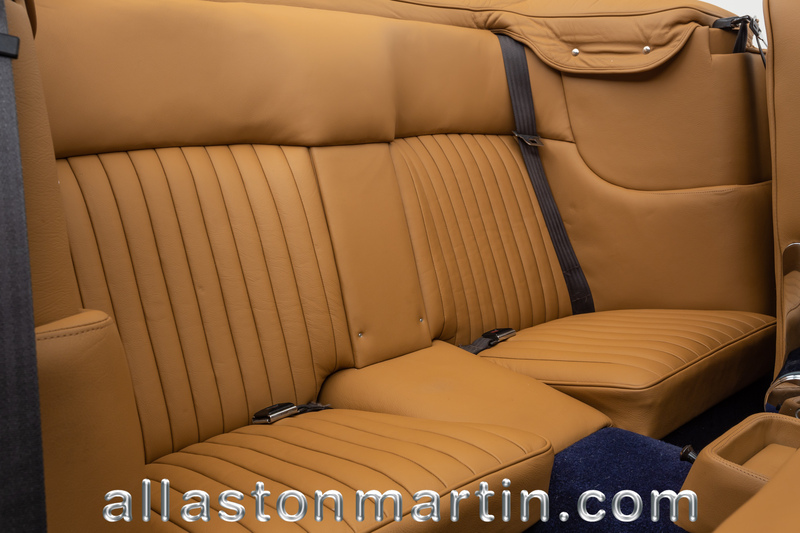 Refit insulation, seats and seat belts. Connect up power steering pipes and fit new rack gaiter. Fit new track rod ends and roughly set up tracking and front suspension. Air conditioning: Connect up all hoses and check all positions. Remove compressor and change the orientation for bonnet clearance. Charge system and add flushing agent. Vacuum system, replace receiver drier, re-gas system and run up. Fit new pressure switch, repair fault to switch on dash.